How To Get Your Grand Final Fix This Weekend! West Coast fans, make sure you tune in! Obviously, the AFL Grand Final is a massive deal... even MORE so when the West Coast Eagles are there for the big game. In the lead-up to the big game, mix94.5 will be amping up for bounce down like never before. From 8am, Adrian "Barra" Barich and Tania Armstrong will be previewing the big game. They'll be chatting with the doyen of doyens, Dennis Cometti, as well as former West Coast Eagle Sam Butler. It won't all be footy though... Barra and Tania will also be chatting with NRL legend Gordon Tallis about the big NRL Grand Final between the Storm and the Roosters. Finally, they'll also be crossing to Utah, to catch up with the one and only Damian Martin, who's over there to take on the might of the NBA. It's the biggest preview in footy. JB, BT, Duck, Billy Brownless, Damo, Neroli Meadows and the regular team will be joined on stage before the game by Luke Darcy, Chris Judd, Paul Roos, Mark Ricciuto, and many, many more. All live from the MCG. It's on... the BIG game between the West Coast Eagles and Collingwood. Chris Judd, BT, JB, Neroli Meadows and Luke Darcy will be there calling every pulsating moment. 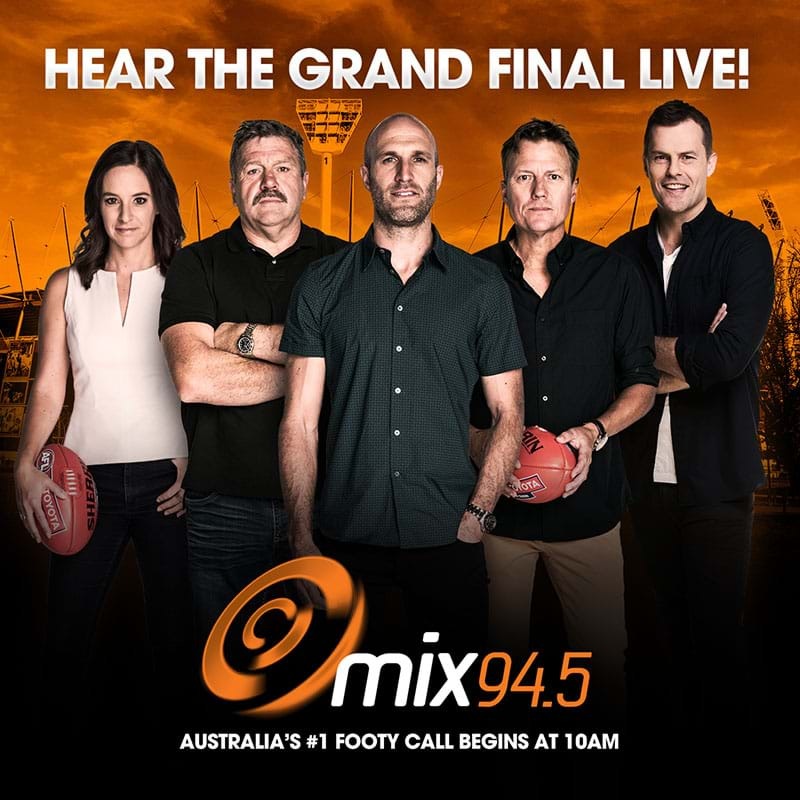 Keep it on mix94.5 for all your 2018 Grand Final action.